At the end of April I went to see a friend for little get away. I had made this card to leave as a thank you when I left. I have been really working on NOT hoarding my patterned paper and using it instead so that is how this card came to be. I made a card with matching envelope using Patterned Paper :) Aren't you proud! LOL You fellow paper hoarders know what I mean. I stamped my image on light blue paper and colored with my Copic's. 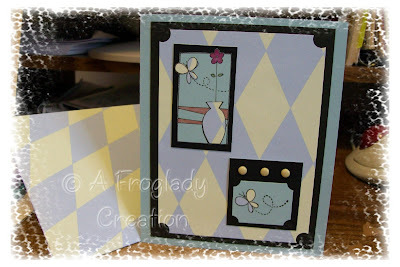 Then I stamped and cut out the butterflies and vase on the patterned paper then I pieced them on top of the stamped ones. Gave it a little dimension. I notched the edges of the patterned paper and then mounted it on black and then onto the blue base card. The images were cut out and then matted with black card stock also. On the flower image I used my Spica Glitter Pen to color the flower and give it a little bling while on the butterfly one I notched the edges before matting it then added 3 brads to the top of the black. Then I added them to the front of the card. I am not at home to list the stamp set but it is a TAC one.